Cho Oyu is the sixth highest mountain in the world at (8,201 meters/26,906 feet). Cho Oyu is known as being one of the easiest of the 8,000 meter peaks due to its straight forward approach and lack of objective dangers. Cho Oyu means “Goddess of Turquoise”, as its stark shadows appear this color in the light of the setting sun when viewed from Tibet. Cho Oyu It is located about 30 kilometers west of Mt Everest and straddles the border between Nepal and Tibet. Mount Cho-Oyu was first climbed on on October 19, 1954 by Austrian Joseph Joechler, Herbert Tichy, Pasang Dawa Lama (Nepal). There are two climbing routes, one from the south (Nepal side) and another from the north, which is the west ridge and commonly referred to as the normal route. The mountain is semi-technical with short ice cliffs a rock band and several crevasses. 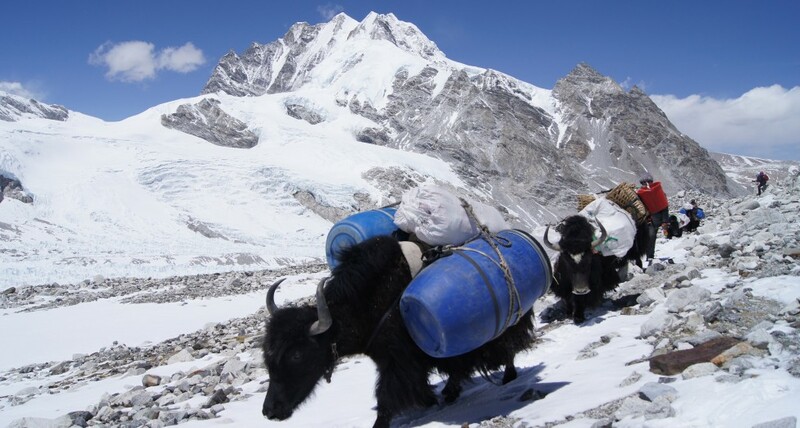 We provide both full board and base camp logistic services on Cho Oyu.We recommend using the full board services for safety, a secure mountaineering experience and your best opportunity to reach the summit. However, some experienced climbers may opt for climbing without support above base camp from a guide or Sherpa. The team will assemble in Kathmandu and gather any last minute items. Upon arriving in Kathmandu, it will take 2 working days to obtain your Chinese Visa and climbing permit, but we will submit and take care of the details for you. The team will then travel overland via the Friendship Highway to Tibet.The journey takes you across the Tibetan Plateau, where you stop in Tingri and Nyalam along the way to acclimatize, before reaching the Chinese Base Camp. From the Cho-Oyu Chinese base camp, you will trek to middle camp for an overnight stay and next day make the journey to Cho-Oyu advance Base Camp, which sits below the North West face of the mountain. The route above advanced base camp consists mainly of low-angled snow slopes up to 35° with one short but very steep section to bypass a Sérac barrier at 6,475 meters. 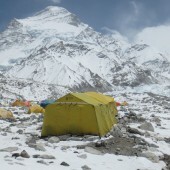 Most of the climbers use two or three camps on the mountain before reaching the summit. 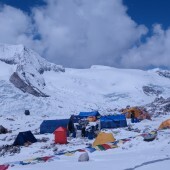 Camp 1 is located at 6,400m, Camp 2 around 7,100 and the highest camp at 7,450m.Most of the climbers try to summit push from camp two and return to camp two. However, we like to make this decision based upon the health and fitness of the clients during the summit push. We are always flexible and the plan might change due to weather, fitness, illness or other unseen events. 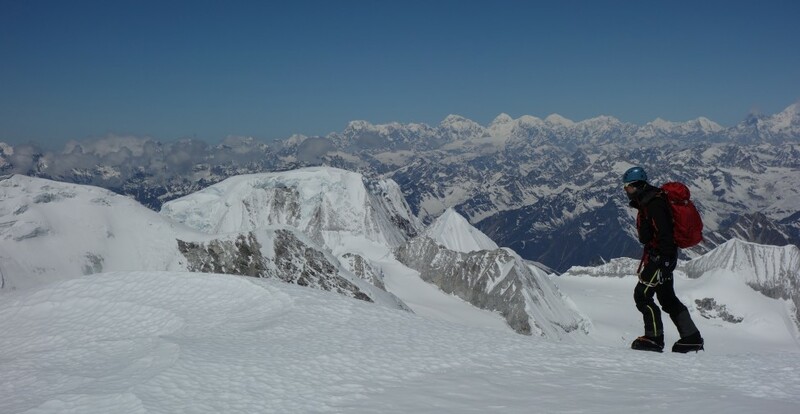 Generally the team will spend 22-23 days committed to the summit objective, with multiple equipment and supply carries and acclimatization climbs to camp 1, 2 and 3, before attempting the summit. Satori Adventures provides top quality service to ensure safety, comfort and support that will maximize each client’s chances of a successful summit. For us quality of the service means, we always use private transportation from Kathmandu to base camp in a comfortable Jeep, we only use experienced and trained climbing guides, an expedition cook and experienced base camp staff. Meals are freshly cooked, with snacks and drinks available 24 hours in your dining room. We only use the highest quality personal tents, a spacious and comfortable dining tent with functional and comfortable furniture and an efficient heater, showers, solar panel for charging and lighting are all part of our advance base camp facilities. 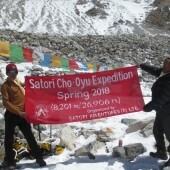 Our Cho-Oyu climbing guides are experienced and qualified. We provide extensive training to our staff in technical western style climbing, as well as English, customer service and Wilderness First Aid. Most of our guides are qualified via TAAN, NMA and NATHAM. They have many years of experience on big peaks and are highly skilled in all aspects of Nepal mountaineering and all hold a Nepal Government License, Mountaineering Association Accreditation and Summit Certificates of Nepal Himalayan peaks. They have thorough technical training and practical experience in rock climbing techniques, ice and snow techniques, and logistic knowledge and experience to setup and operate high altitude camps, experience in high altitude camping, techniques with fixed rope climbing, belay techniques, use of any type of mountaineering gear, use of Oxygen, high altitude food, avalanche and high mountain rescue techniques. Cho-Oyu Advance base camp located below North West face route at elevation of 5,700m/18,700 feet is very comfortable and scenic. This location is surrounded by spectacular glaciers and peaks with full frontal view of the entire Cho Oyu route from the tent. The climbing route to the summit is approximately 12 km long with elevation gain of 2,501m. You will spend approximately 22 days here. Cho-Oyu advanced base camp is generally sunny due to its location with the sun being out early and staying late in the day. There are approximately 7-15 climbing teams each spring and autumn season. From advanced base camp to camp will take most people 4-6 hours. This trip starts out walking along the Gyabrag Glacier, before moving to a steep scree slope that takes you to the shoulder of a broad snow field and camp I. While camp I is set in a generally safe location, there are always risks of avalanche on any big mountain and proper safety precautions and tent set-up are important. Camp two is located at 7,100m/23,294 feet on a wide snow face just above a prominent 25 meter high ice cliff. To make climbing the ice cliff safer, we will fix a line up the cliff making this part of the trip safer and more enjoyable. From camp I to camp II will take most climbers 5 -7 hours on mostly 35-38 degree snow slopes. Camp III is located at (7,500m) which leaves the climbers with a 700 meter push for the summit day. Camp II is located just below the yellow band, which is a rock cliff that must be negotiated to reach the summit and is sometimes covered in snow. The climbing route is a straightforward, but steep snow slope above the yellow band, but very strenuous. Since we will only spend a short amount of time at camp III, this camp does not contain many amenities. Around 45% of climbers will utilize bottled oxygen above camp III. 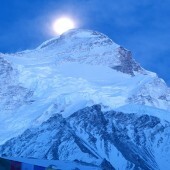 Most climbers will leave camp III for the summit around 0100 hours. 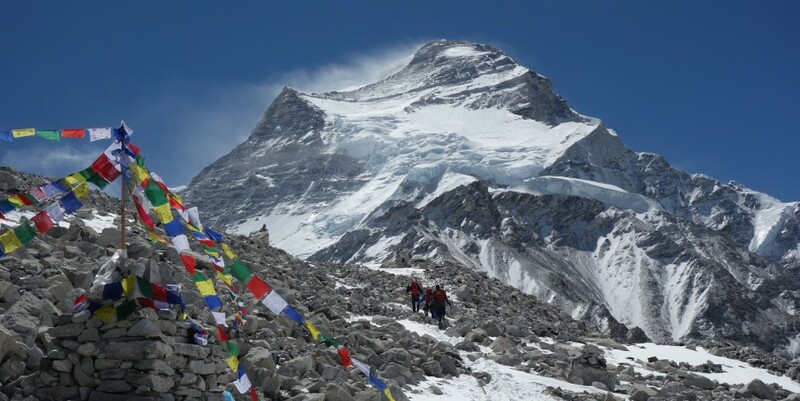 Upon leaving camp III it will take you 7-9 hours of hard work to reach the summit of Cho Oyu. Most climbers will reach the summit between 0700 and 1000 hours if the weather is stable and conditions are good. After crossing the yellow band, which is not difficult at sea level, but can be challenging at 7,800 meters, the remainder of the summit day is a long steep snow slope that requires climbers to dig deep and keep focused. 14 April/Day 07: Rest day at Tingri for acclimatization.The climbing Sirdar will take you up to a (5000m/16404ft) hill for acclimatization after breakfast. 15 April/Day 08: After breakfast drive from Tingri to the Chinese base camp (4800m/15750ft.) which is about two hour drive. camping accommodation. 16 April/Day 09: Rest and acclimatization at Chinese base camp (4800m/15750ft). 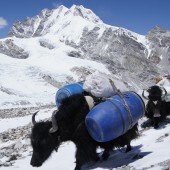 To arrange yaks to go to advanced base camp via middle camp. 17 April/Day 10: Trek from Chinese Base Camp to Middle Camp(5300m/17388ft.) along the 4x4 track. camping accommodation. 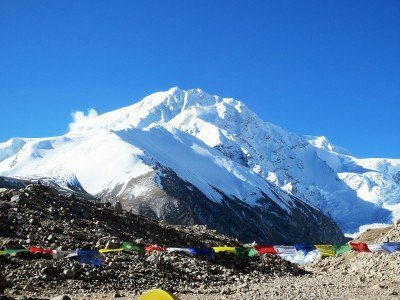 18 April/Day 11: Trek from Middle Camp to the ABC (5700m/18700ft) of Cho Oyu camping accommodation. 18 May/Day 41:Drive from Tingri to Kerung Height(3200m/10499ft) overnight at tea house accommodation in B/B plan . 19 May/Day 42: Early in the morning drive from Kerung height to Kerung border, finish immigration formalities to cross the boarder and then drive to Kathmandu,transfer to hotel. 20 May/Day 43: Free day in Kathmandu and Nepalese cultural program with farewell dinner in the evening. Our climbing Sherpa guide team will establish and secure climbing route in collaboration with other climbing teams participating on the route; Establish all high camps with camping equipment, provisions and oxygen and prepare high altitude food for his client; Assist his client on the route and ensure client safety and well being on the route through guiding and negotiating the route access priorities at pace and schedule determined by clients’ physical condition and preferred pace; Ensure total commitment to the client in case of emergency with clients’ safety and well being as overriding priority. All arrival and departure transfer services to and from international airport with other necessary surface transportation as per itinerary. Assistance at the international airport by Satori Adventures representative on arrival and departure. 5 night request star hotel accommodation in Kathmandu as per itinerary. Land Transportation from KTM-KERUNG-KTM for Climbing members and Staff. Chinese Government Royalty for Cho-Oyu Expedition for group and climbing Sherpa guide. 1:1 Climbing Sherpa guide each member and leaders will be included. All wages, equipment, medical and accidental Insurances for cook, climbing Sherap guide and base camp staff. Summit bonus for climbing Sherpa Guides as per Mountaineering Association rules. 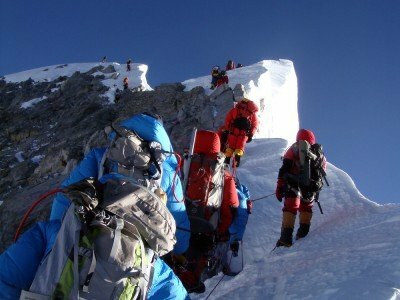 Minimum US$ 1000.00 per climbing Sherpa guide. 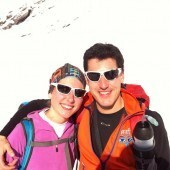 Summit bonus for climbing Sherpa guide, minimum US$ 1000.00 per climbing Sherpa guide. Satori Adventures provides very professional, helpful and friendly service from Kathmandu to the ABC as well as during the climb. Our objective is to provide a good quality, helpful, safe, friendly, stress free and comprehensive service to maximize summit opportunity. In the Base camp our cooks and helpers will prepare and serve three delicious freshly cooked and plentiful meals a day and will ensure that hot and cold drinks are available 24 hrs a day. In the Base Camp we provide spacious expedition quality personal tents for all our clients both with full board or base-camp service only. In base camp we also provide dining tent, kitchen tent, toilet facilities and portable shower facilities and tent accommodation for our staff. All arrival and departure transfer services to and from Airport . 05 Night request star hotel accommodation in Kathmandu as per itinerary. All wages, equipment, medical and accidental Insurances for cook, and base camp staff. 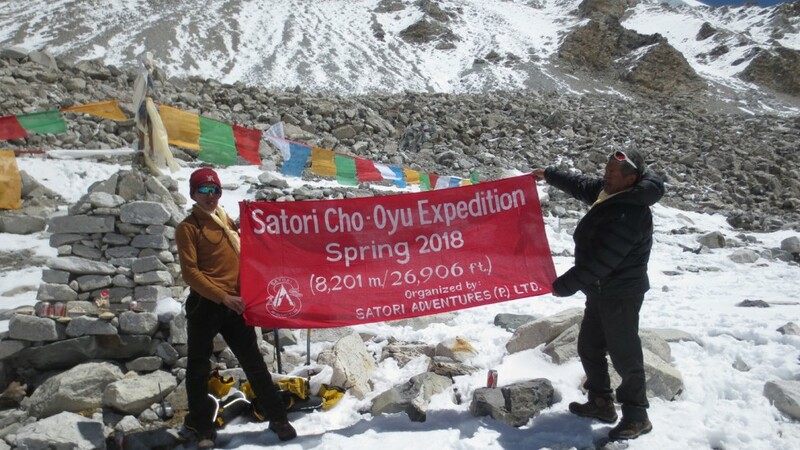 Why climb with Satori Adventures in Cho-Oyu? 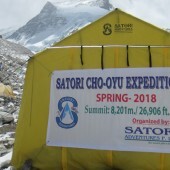 Satori Adventures Everest expeditions have been at the forefront of providing top communications for our Everest expeditions. This allows us to obtain and deliver comprehensive weather forecasts via U.S., European and Kathmandu weather forecasting. Our lead guide is always equipped with a satellite phone during the climbing and at base camp. Two way radio communications between climbing members, guides, Sherpa and base camp staff is also provided. There is also local mobile network available at base camp that provides easy connection with your family during your stay at base camp. Satori Adventure focuses on comfortable conditions at base camp, including good quality food and other services. We find this helps clients with their overall success rate on the mountain. Our cooks are regarded as the best in the business, providing wholesome and appetizing meals with an agreeable array of menus to suit all your food requirements. The meals you are served on the mountain are also of the highest standard and designed to sustain you for the rigorous ascent. We offer various choices that will suit any diet plan, including vegetarian, Vegan, continental, Indian and others.If you have special food consideration, please provide this to us 60 days prior to the expedition so we can plan the best meals for your trip. The approach on its Cho-Oyu North face ridge Base camp is through the Kodari Boarder of Nepal leading up to Cho-Oyu Glassier. It starts with the drive from Kathmandu to Kodari Border After immigration formalities, drive to Naylam(3700M), to Tingri (4,300m) to Chinese Base Camp (5,150m). It takes typically 07 days to reach ABC from Kathmandu. When you arrive at base camp, our staff will set up the camp and you will have time to rest and continue to acclimate. Upon completing a Pooja ceremony at base camp, our team of Sherpa’s will begin to open the route to camp I. When this is completed, our guides will begin to take clients and loads to camp I. Depending on your physical fitness and bodies’ reaction to altitude, you may stay at camp I for a second night, or move up to camp II and then descend back to base camp. Our team will then open the route and fix the lines to camp II and supply the camp with gear, equipment and food. If required for acclimation and if the weather conditions allow, you may sleep a second night at camp II, or proceed up to camp III and then return. During your rest and time at base camp our team will continue to open the route, fix the camp and line and supply food, oxygen, and equipment and prepare for the summit push. After your camp I and II acclimatization, our climbing guides will check the weather forecast, group fitness and recovery conditions. If upcoming weather reports, your physical fitness and conditions are good, we will begin the summit push. On the summit push, you will move to camp I, camp II and then camp III before moving to the summit. At camp III you will awake at 0100 hours and begin the summit push. 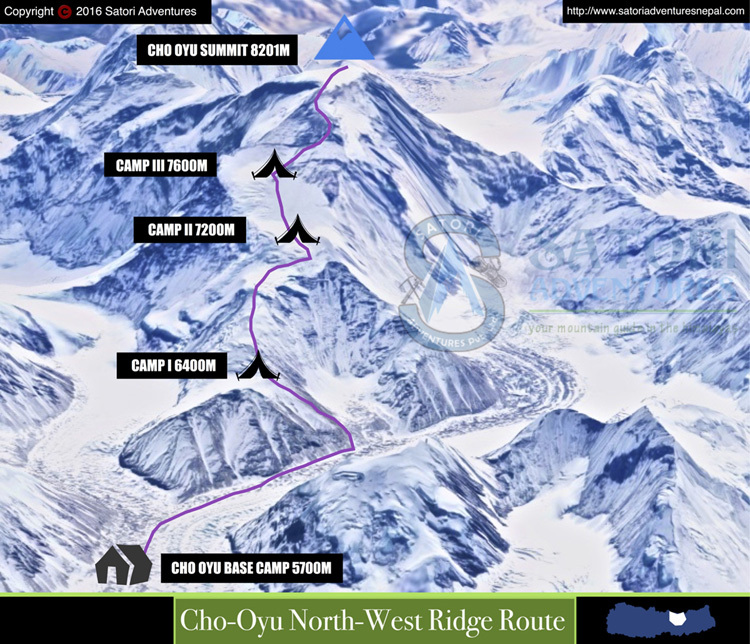 If due to any reason (bad weather, group physical fitness, accident, incidence) we have to return to base camp before the summit push, but still have climbing time, good weather conditions and climbers are interested for another summit push, we will provide one more opportunity. However, more than 98% of climbers either summit on the first try, or give up the trip after the first summit attempt. Most experienced expedition operator in the Himalaya. The Great Trigonometric Survey of India, part of the British Survey of India which began in 1803, made distance measurements of many high Himalayan peaks in the 1850s including those in the Mount Everest region. Cho Oyu, not originally assigned an identification number, was later named T45 and then MI since it appeared to be a minor peak. 1921 First Exploration of Cho OyuLieutenant Colonel Charles Howard-Bury (1883-1963) led a British Everest reconnaissance expedition that explored the Cho Oyu area. The group included George Leigh Mallory, who was on his first trip to the Mount Everest region. They explored the area for two months and made the first photographs of Cho Oyu from Nangpa La, a high pass between Nepal and Tibet. A British expedition led by Eric Shipton made a serious attempt to climb Cho Oyu. 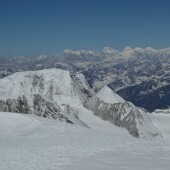 Shipton's goals for the ascent, besides the summit, were "to test the ability of several mountaineers to climb to great heights;" to find a group of climbers able to attempt Mount Everest in 1953; to test oxygen gear, clothing, and equipment; and to study the physiology of high-altitude climbing. Unfortunately, the Chinese closed the Tibetan side of the mountain and the best feasible route. The climbers, including Edmund Hillary, attempted the Southwest Ridge but failed so they tried the illegal northwest side of the peak alpine style and reached 22,400 feet before defeat. Hillary had "felt almost a sense of shame that we'd allowed ourselves to admit defeat so readily." 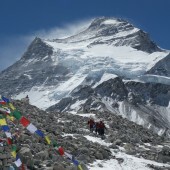 Cho Oyu was successfully climbed in the post-monsoon season of 1954 via the Northwest ridge. At 3:00 p.m. on October 19, Austrian climbers Joseph Jöchler and Herbert Tichy and Sherpa Pasang Dawa Lama who led the ice cliff that Shipton had described as "obviously impassible." (AAJ 29 1955, p. 178) stepped onto the summit of Cho Oyo after climbing almost 4,000 feet in ten hours from Camp IV. 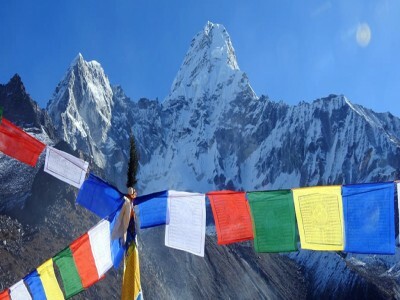 Both Austrians were suffering from severe frostbite, while Pasang, having hiked over 30 miles and gained 10,000 feet to Camp II after going down for supplies, wept tears of joy, which froze on his cheeks, as he unfurled the flags of Nepal, Austria, and India on his ice axe.This route has remained as the standard climbing route for commercial expeditions since. On May 13 Carlos Carsolino got the summit implementing a world record speed ascent from base camp, reached in 18 hours and 45 minutes. First solo ascent via the South West face by Yasushi Yamanoi. On October 2, Slovenian Pavel Kozjek speed-climbed a new route on the Southwest Face in a single solo ascent from advanced base camp. The crux was a vertical icefall, which was bypassed with 5.6 rock climbing. He reached the summit in 14 hours.